Well, that’s another year gone! 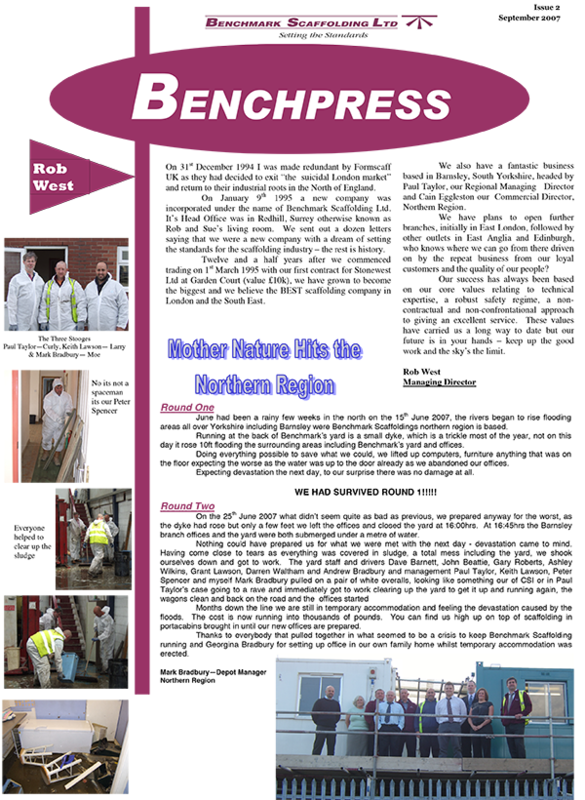 By the time you are reading this edition of Benchpress spring will, hopefully, be well and truly underway with the snow and ice a distant memory. 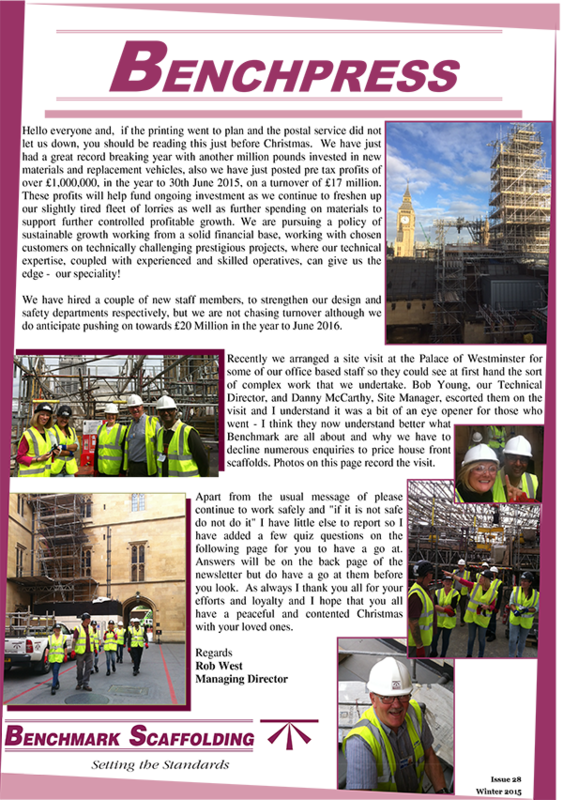 Those freezing conditions really don’t help us scaffolders - we look forward to better weather ahead! 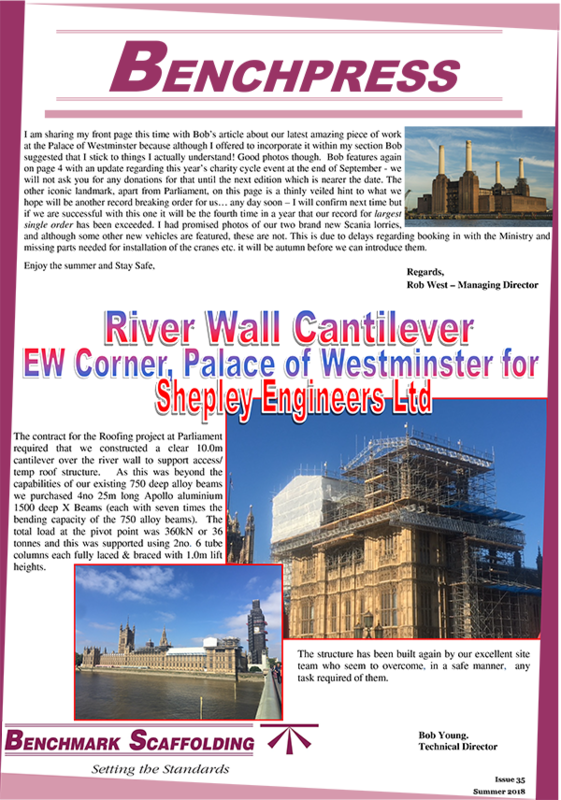 Our contract at the Palace of Westminster required that we constructed a clear 10.0m cantilever over the river wall to support access/ temp roof structure. 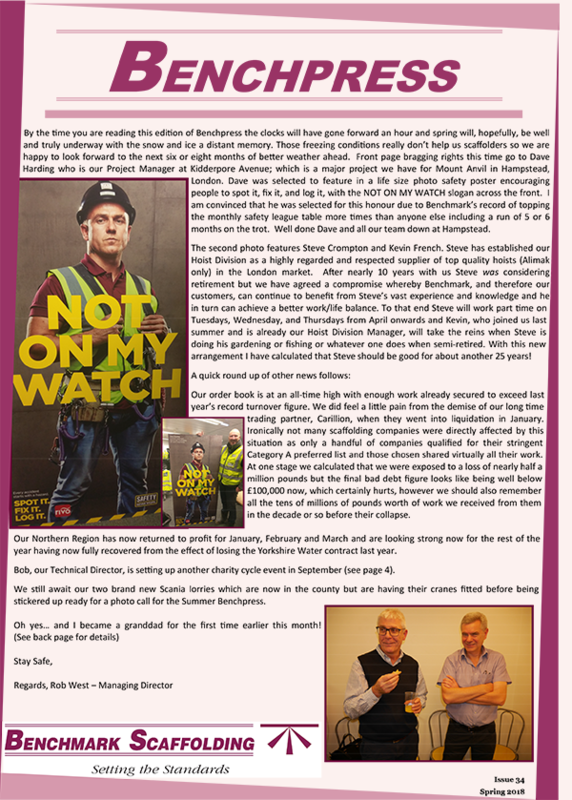 Front page bragging rights in our Spring Edition go to Dave Harding who is our Project Manager at Kidderpore Avenue - a major project we have for Mount Anvil in Hampstead, London. 2017 has been a good year for the Company – our most successful ever in fact. We have again increased sales, this means breaking through the £20 million barrier, and also posted pre-tax profits of £1.6million despite a challenging environment following the Brexit vote. Team Benchmark all survived the London to Brighton charity bike ride! We exceeded our fundraising target, set initially at £5k, by more than double as we banked just under £12,000. Benchmark were again in the top 1 % of givers on the just giving website for the month May 17. 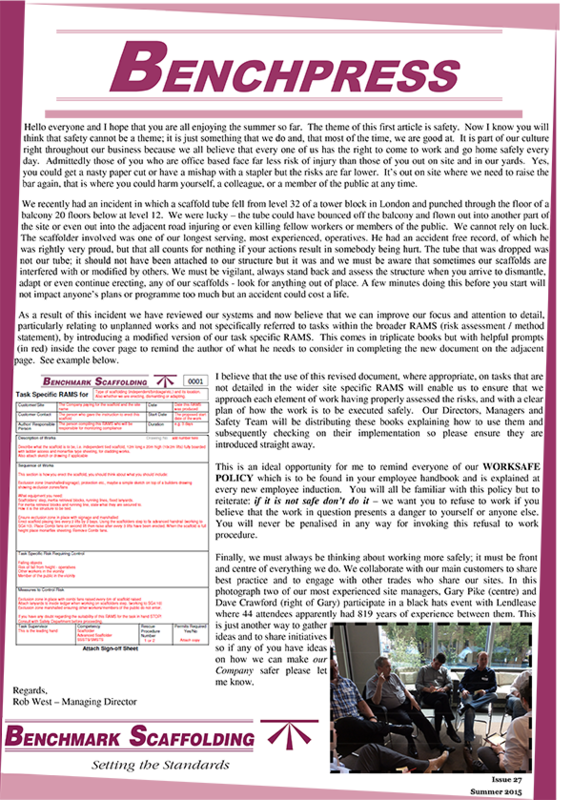 Over the last quarter we have several works with Stonewest and their client The Really Useful Theatre Group. 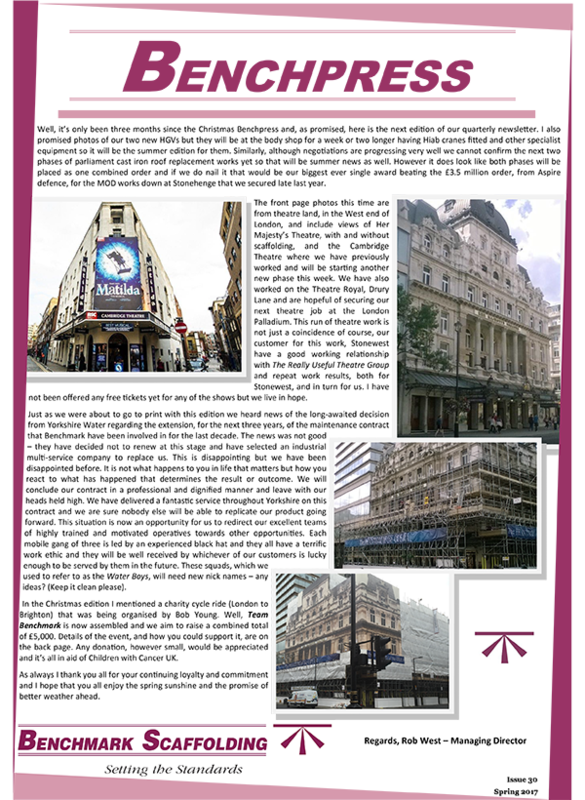 This has included Her Majesty’s Theatre and the Cambridge Theatre in London's West End, where we will start another new phase this quarter. 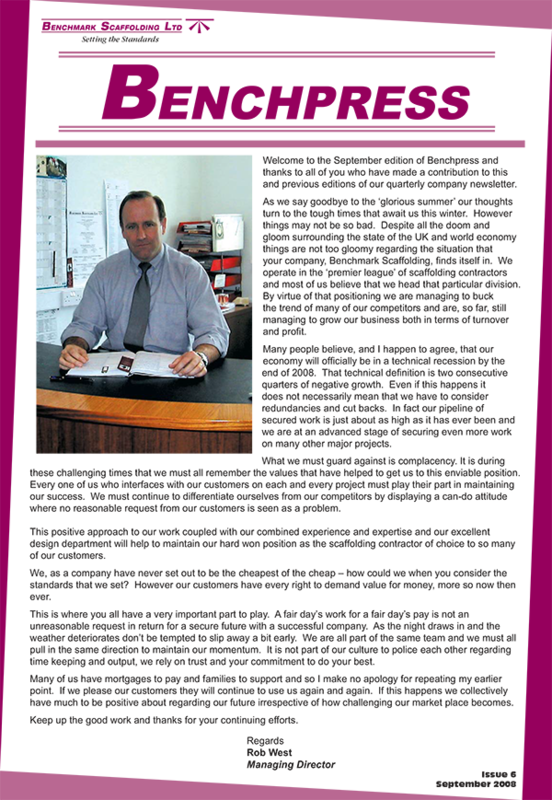 It is in fact a year since the last edition and we have filed another set of accounts with turnover up about £1,000,000 on the previous year and profits up 25%. There is cash in the bank and new vehicles arriving thick and fast. 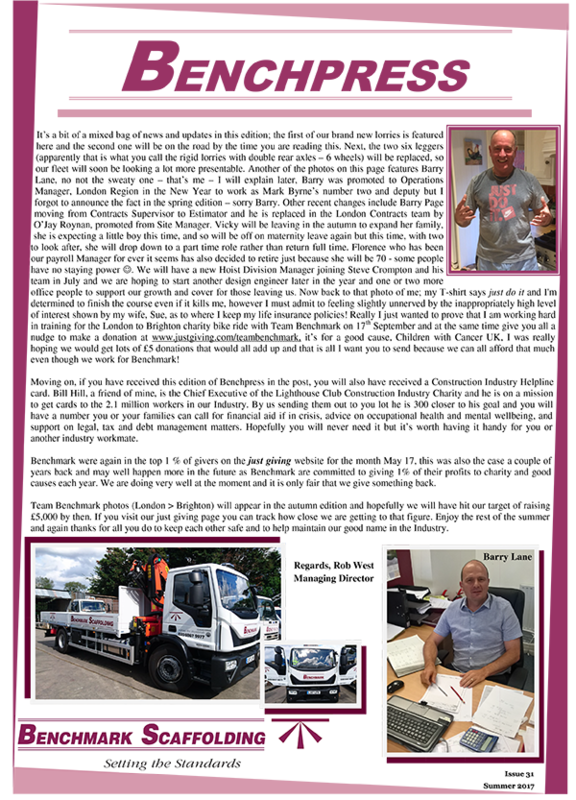 We have just had a great record breaking year with another million pounds invested in new materials and replacement vehicles, also we have just posted pre tax profits of over £1,000,000, in the year to 30th June 2015, on a turnover of £17 million. 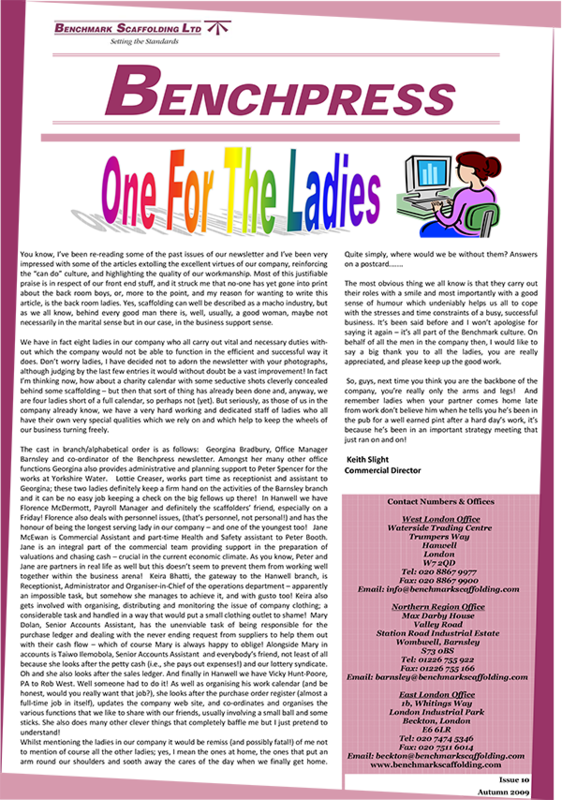 The theme of this first article is safety. It is part of our culture right throughout our business because we all believe that every one of us has the right to come to work and go home safely every day. 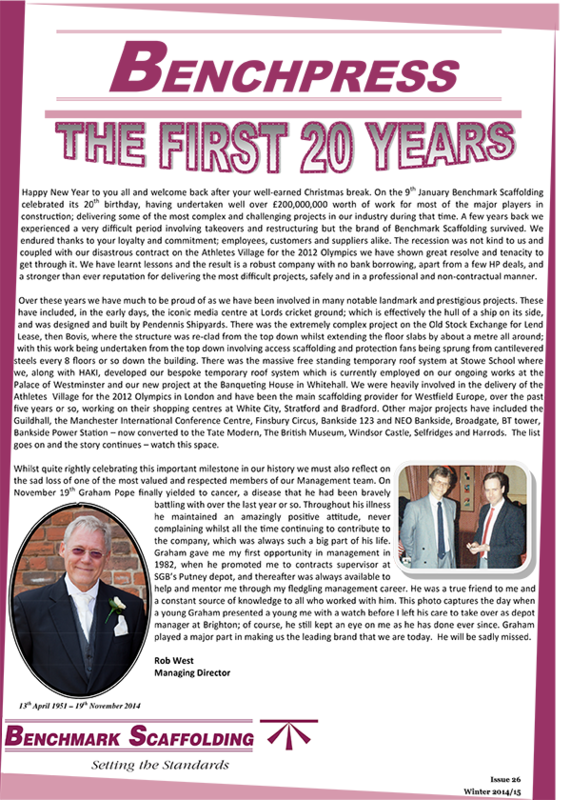 On the 9th January Benchmark Scaffolding celebrated its 20th birthday. In that time we have having undertaken well over £200,000,000 worth of work and delivered some of the most complex and challenging projects in our industry. Many of our team will know Lee Gallagher, shown having just been re-inducted prior to taking on his next role as site manager at our new project for Sisk at St John’s Hill, Clapham. 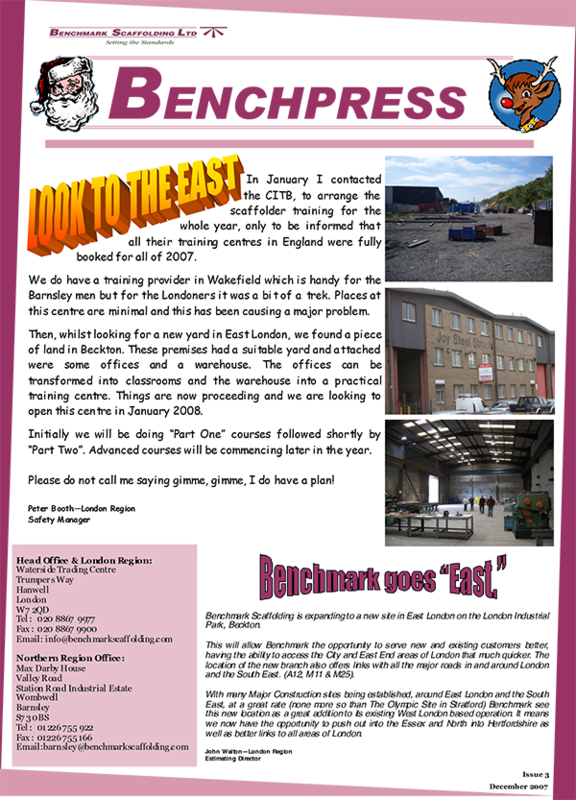 It has been a whole year - since I last wrote to you all through Benchpress and, for those of you who have missed our quarterly newsletter; I confirm that we intend to revert to the previous three monthly editions going forward. 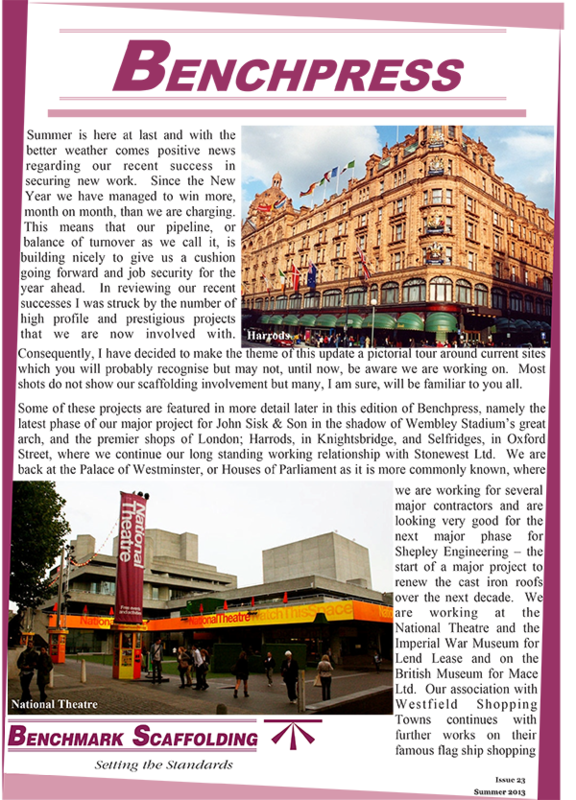 Summer is here at last - and with the better weather comes positive news regarding our recent success in securing new work. Since the New Year we have managed to win more, month on month, than we are charging. 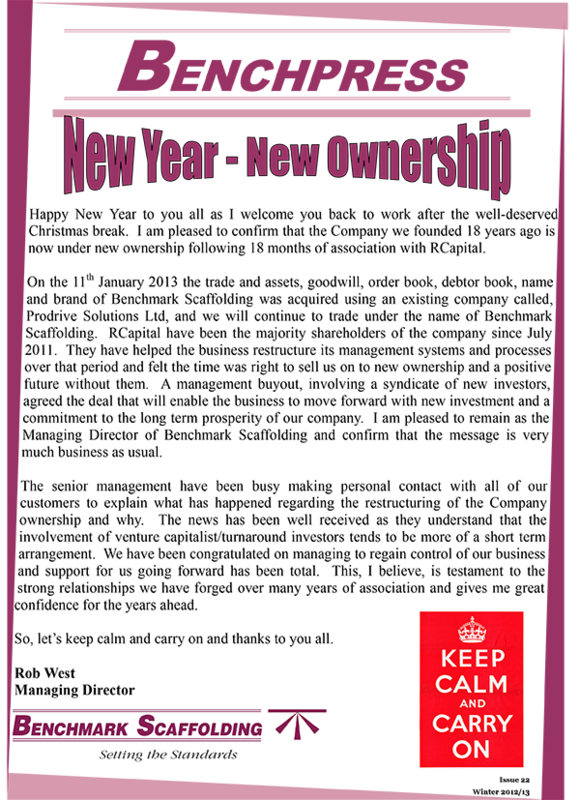 New year - New Ownership. 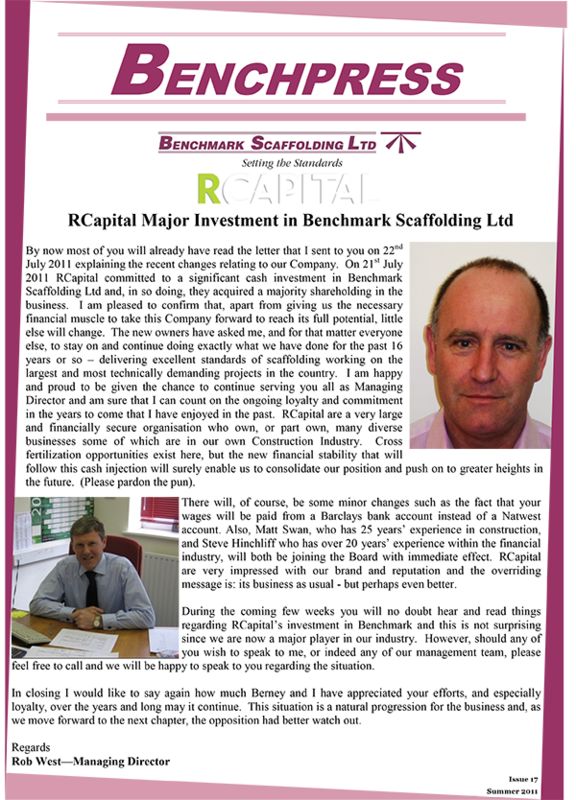 I am pleased to confirm that the Company we founded 18 years ago is now under new ownership following 18 months of association with RCapital. 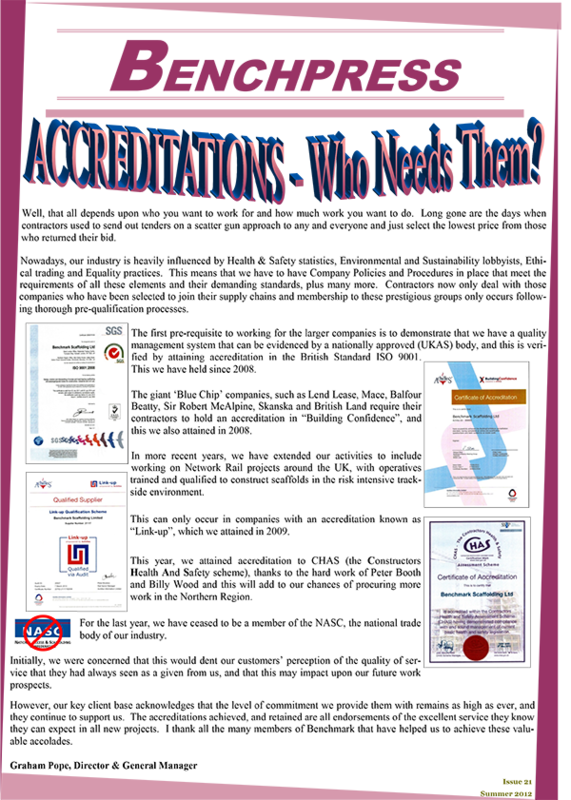 Accreditations - who needs them? - Well, that all depends upon who you want to work for and how much work you want to do. 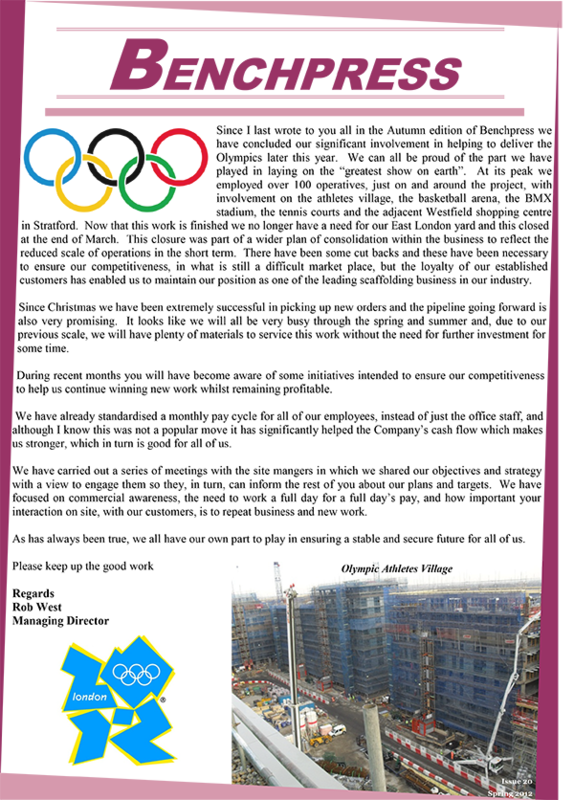 We have concluded our significant involvement in helping to deliver the Olympics later this year. We can all be proud of the part we have played in laying on the “greatest show on earth”! The Parish and University Church of St Mary the Virgin Oxford. 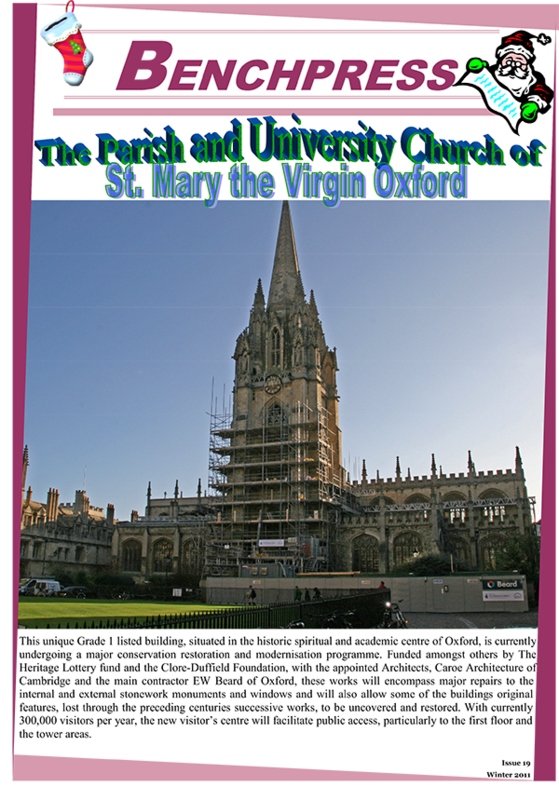 This unique Grade 1 listed building, situated in the centre of Oxford, is currently undergoing a major conservation restoration and modernisation programme. 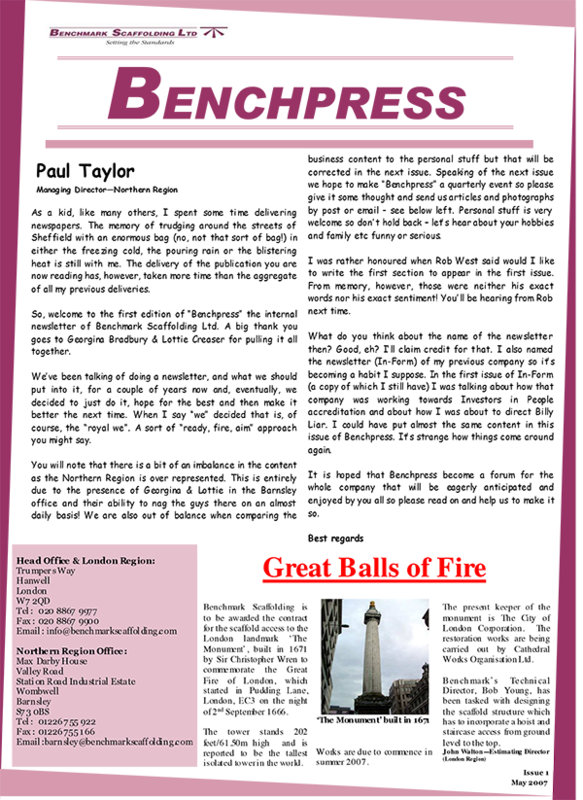 Welcome to a slightly late and slightly thin Autumn edition of Benchpress. We are now back to business as usual following the change in ownership and a few tweaks to the senior management structure. 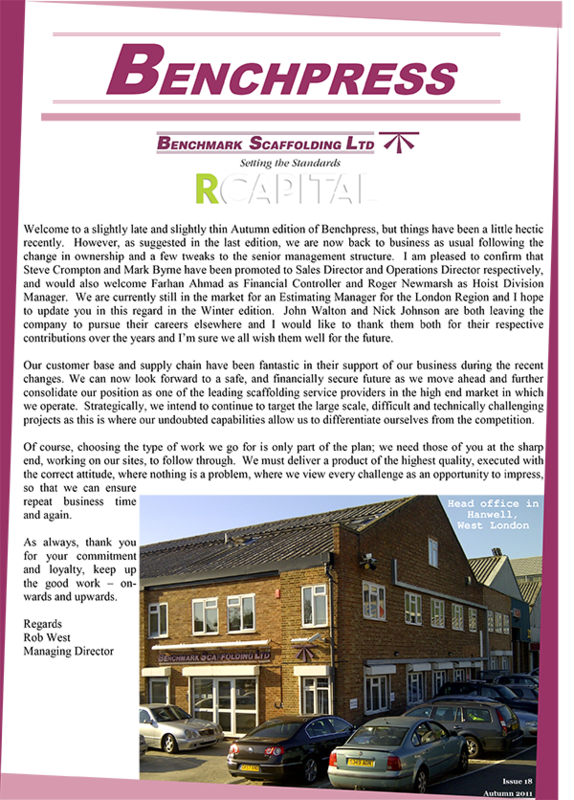 On 21st July 2011 RCapital committed to a significant cash investment in Benchmark Scaffolding Ltd and, in so doing, they acquired a majority shareholding in the business. 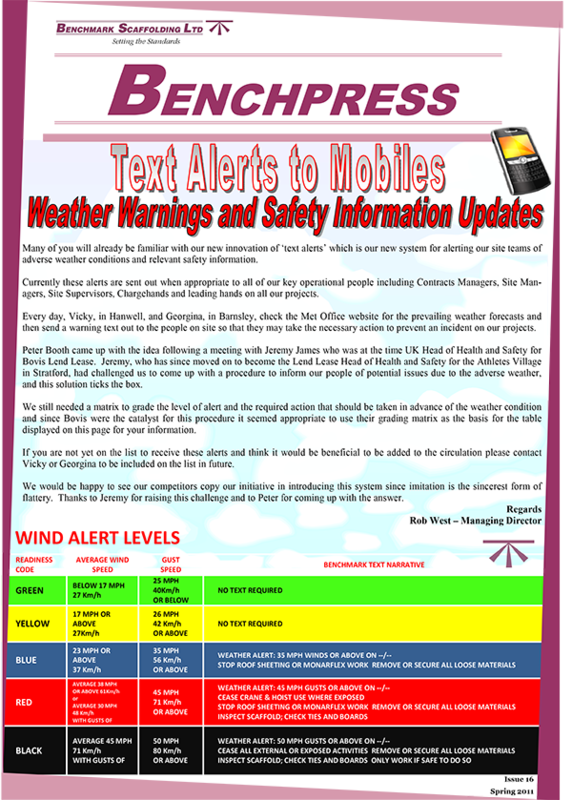 Many of you will already be familiar with our new innovation of ‘text alerts’ which is our new system for alerting our site teams of adverse weather conditions and relevant safety information. 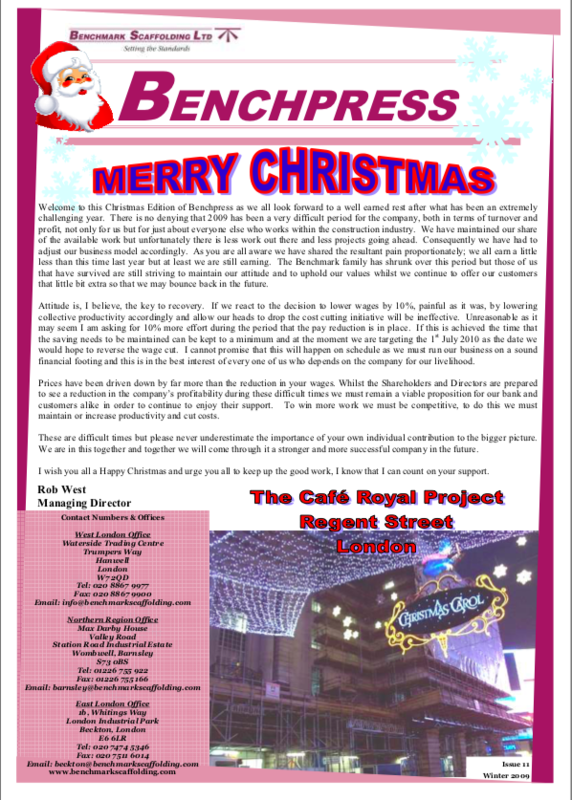 Welcome to the winter edition of Benchpress and Happy Christmas to you all. Firstly, I would like to thank everyone for continuing to work hard to help the Company back to sustainable profitable growth after what has been a very difficult period for us over the last year or so. 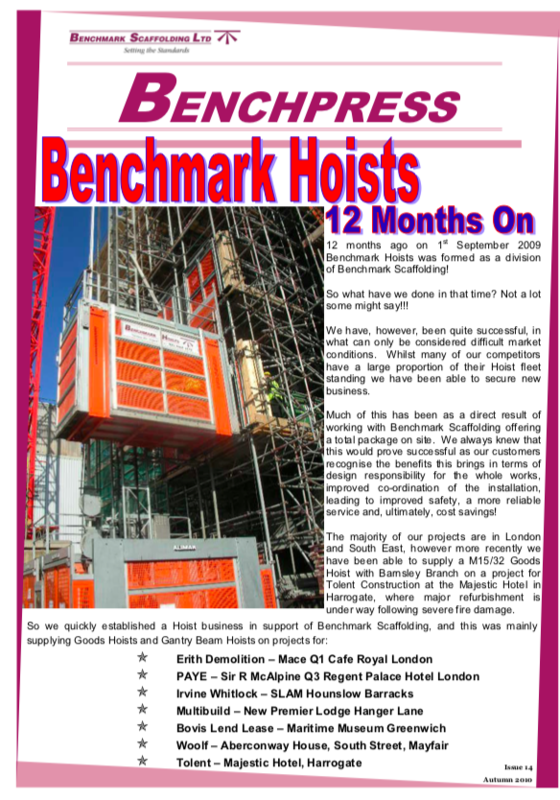 12 months ago on 1st September 2009 Benchmark Hoists was formed as a division of Benchmark Scaffolding! So what have we done in that time? Not a lot some might say!!! We have, however, been quite successful, in what can only be considered difficult market conditions. 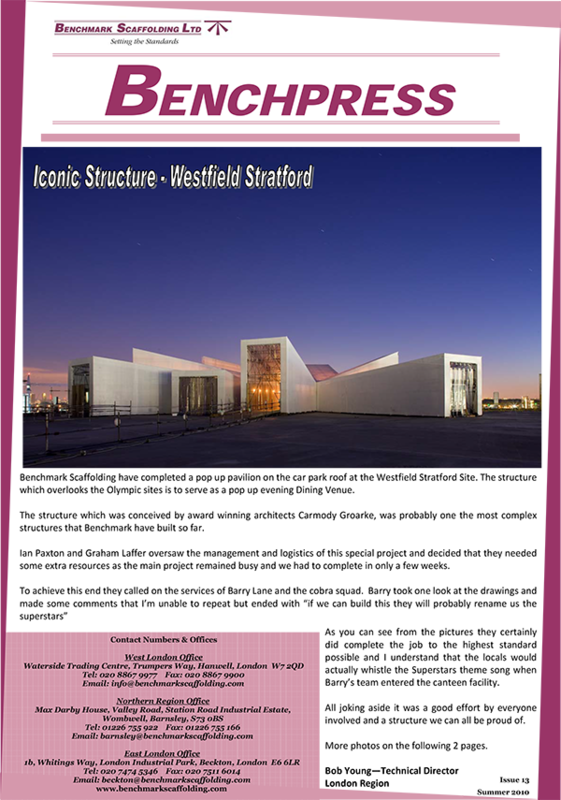 Benchmark Scaffolding have completed a pop up pavilion on the car park roof at the Westfield Stratford Site. The structure, which overlooks the Olympic site, is to serve as a pop up evening Dining Venue. Celebrating 15 Glorious Years! 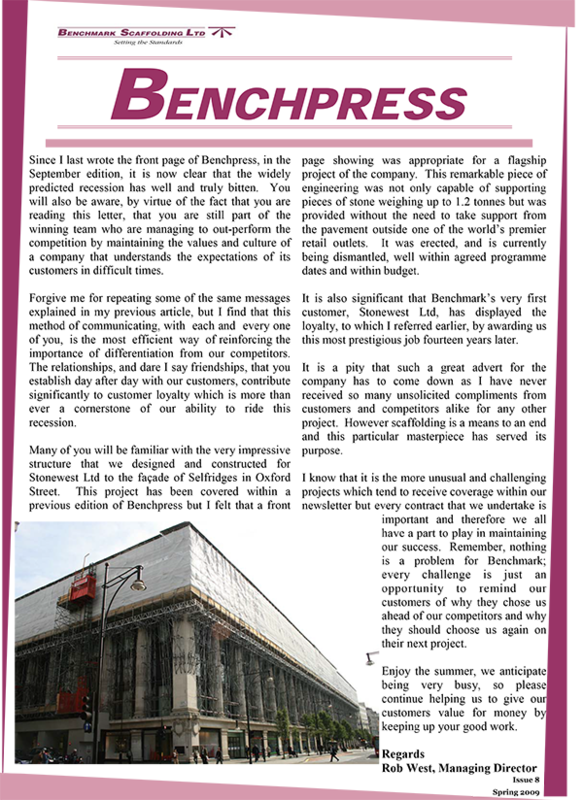 On 1st March 1995, Benchmark Scaffolding Ltd was born. 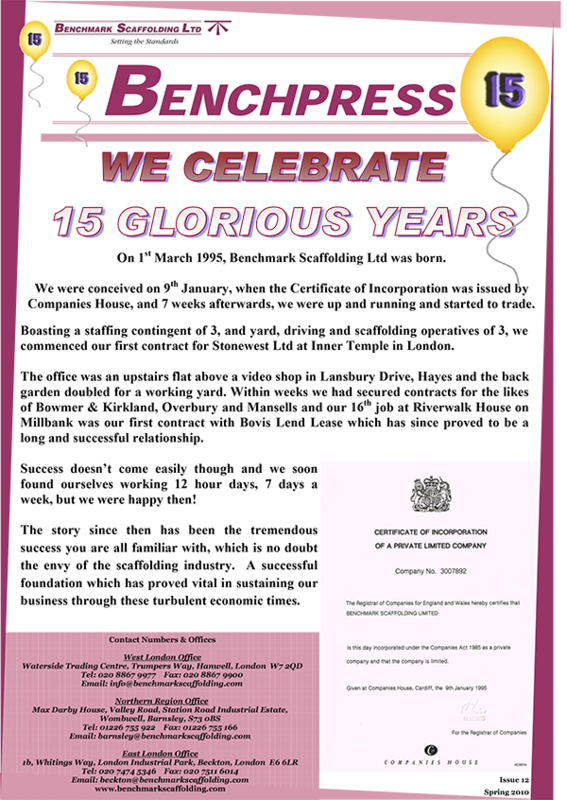 We were conceived on 9th January, when the Certificate of Incorporation was issued by Companies House, and 7 weeks afterwards, we were up and running and started to trade. 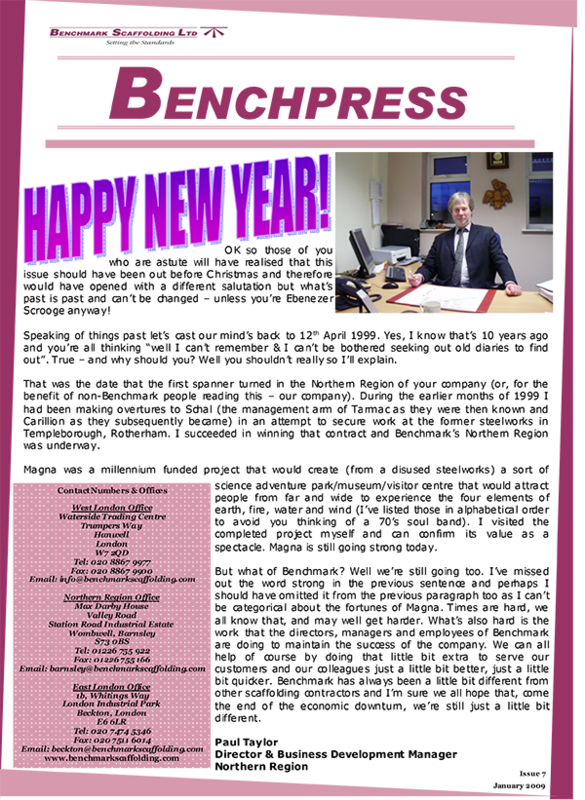 Welcome to this Christmas Edition of Benchpress as we all look forward to a well earned rest after what has been an extremely challenging year. 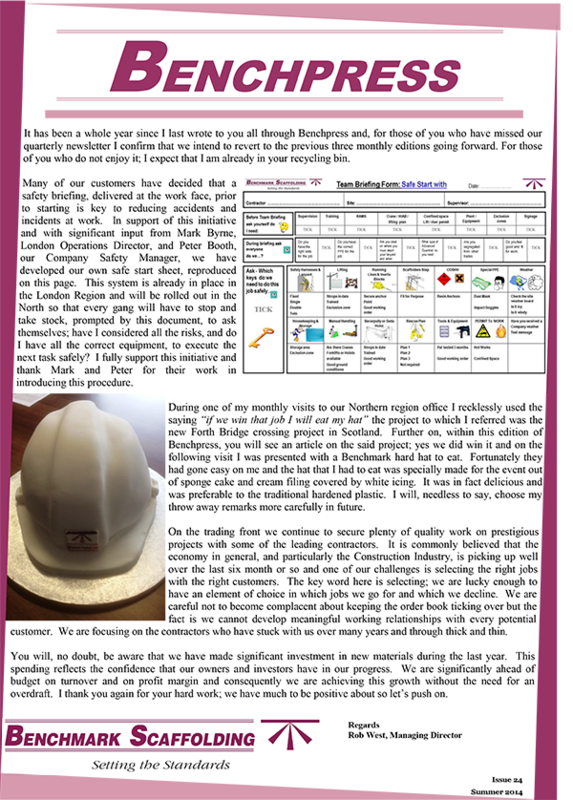 You know, I've been re-reading some of the past issues of our newsletter and I've been very impressed with some of the articles extolling the excellent virtues of our company, reinforcing the "can do" culture, and highlighting the quality of our workmanship. 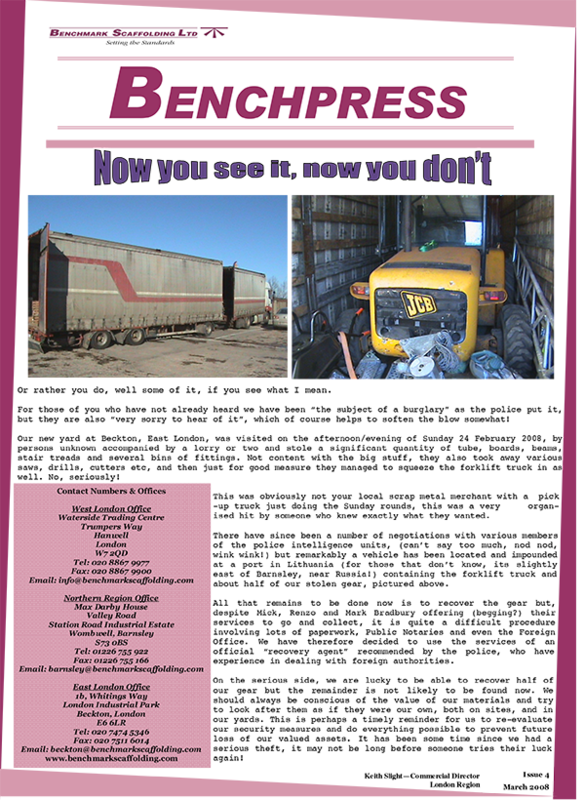 Since I last wrote the front page of Benchpress, in the September edition, it is now clear that the widely predicted recession has well and truly bitten. 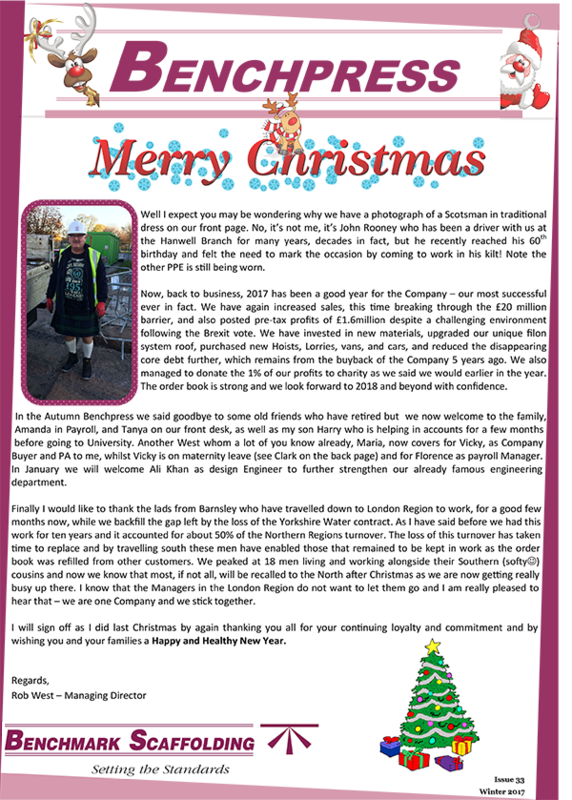 OK so those of you who are astute will have realised that this issue should have been out before Christmas and therefore would have opened with a different salutation, but what’s past is past and can’t be changed unless you’re Ebenezer Scrooge! As we say goodbye to the ‘glorious summer’ our thoughts turn to the tough times that await us this winter. Twelve months on and the Northern Region has relocated to new offices in Barnsley. 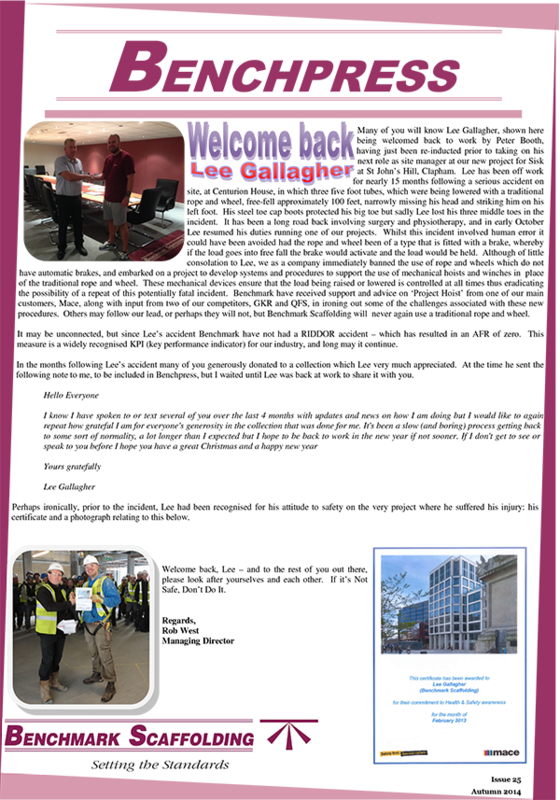 Actually we’ve re-united the existing plot as when Benchmark bought the property from ECL back in 1999 we negotiated with them for their retaining a corner of the plot on which to build their new offices. For those of you who have not already heard we have been the subject of a burglary as the police put it, but they are also very sorry to hear of it, which of course helps to soften the blow somewhat! 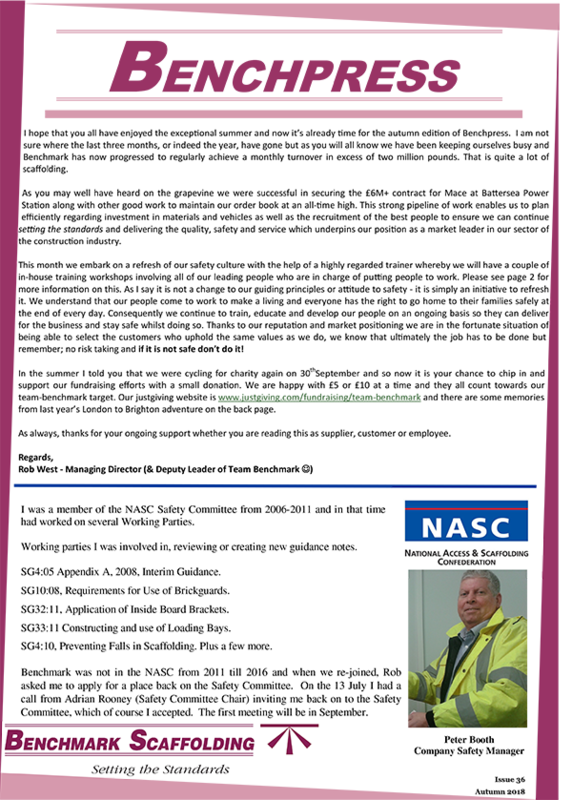 In January I contacted the CITB to arrange the scaffolder training for the whole year, only to be informed that all their training centres in England were fully booked for all of 2007. 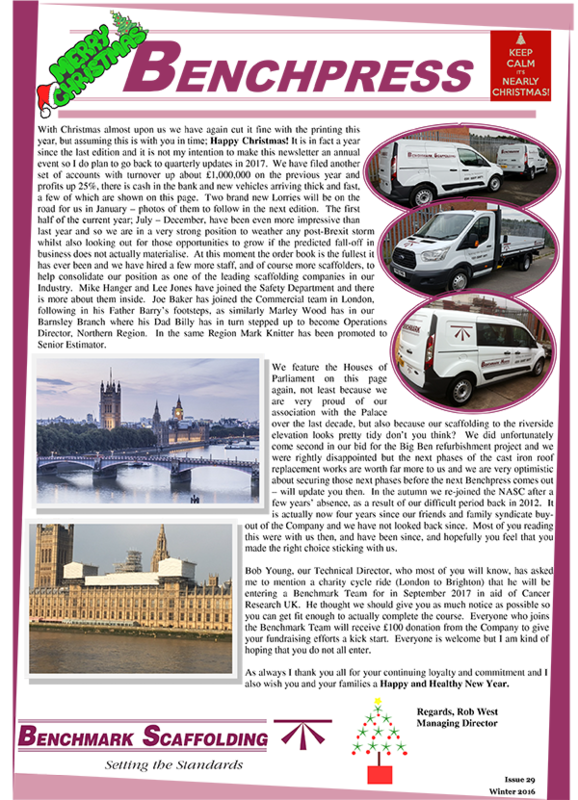 On 31st December 1994 I was made redundant by Formscaff UK as they had decided to exit the London market and return to their industrial roots in the North of England. 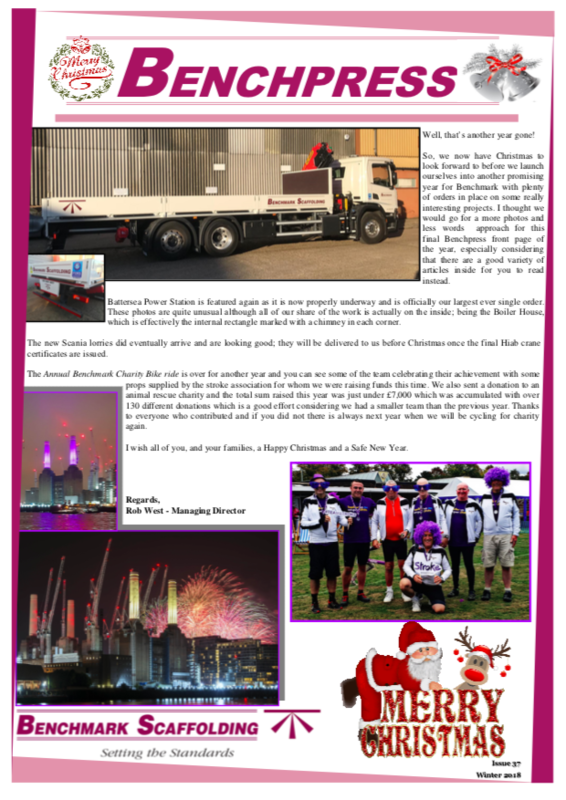 We’ve been talking of doing a newsletter for a couple of years now and eventually we decided to just do it, hope for the best and then make it better the next time. 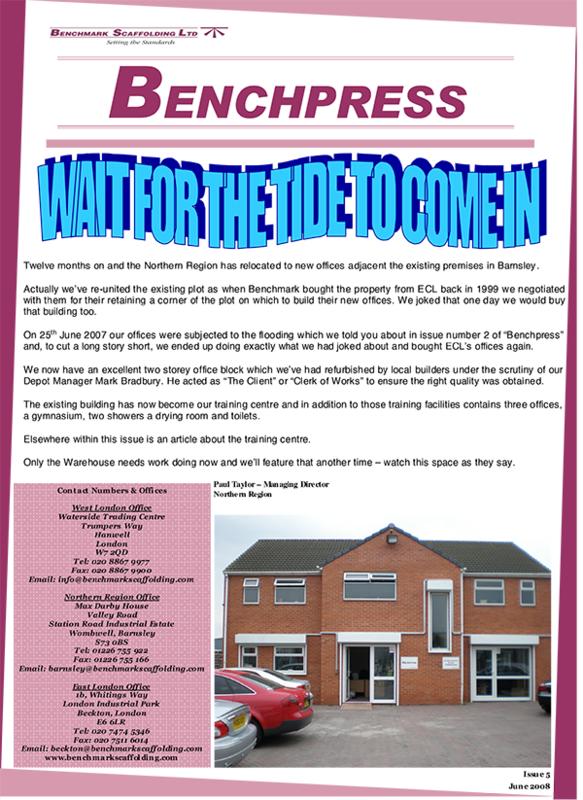 It is hoped that Benchpress will become a forum for the whole company that will be eagerly anticipated and enjoyed by all.